EUGENE, OREGON – April 17, 2012. The Chinese American Benevolent Association is pleased to announce the seventh anniversary of the DisOrient Asian American Film Festival with a selection of highly provocative and unique renowned films. Now on its seventh year, this all-volunteer run “community” film festival founded showcases films rooted in social justice that promote new, complicated, and dynamic portrayals of that break the stereotypes Asian America. This year’s festival hopes to expand the scope of Asian American Cinema. DisOrient opens with the movie Touch by Minh Duc Nguyen, the touching and offbeat tale of a shy auto mechanic becomes a regular at a VIP nail salon to get his nails done by manicurist Tam, a Vietnamese-American who’s just as much a couples therapist as manicurist. Scheduled at 6:30 pm on Friday, April in the Ford Lecture Hall of the University of Oregon’s Jordan Schnitzer Museum of Art. Producer Mellissa Truong and Actress Porter Lynne Duong will be in attendance. The film showing will be followed by a reception for VIP guests, volunteers and filmmakers at the UO Jordan Schnitzer Museum of Art, featuring entertainment by The Craig Chee Band. Saturday’s film offerings at the Bijou Art Cinema start at 12:15 pm with the feature documentary ‘Jimmy Murakami: Non Alien’, telling the story of unimaginable horrors that happen to ordinary people caught in the middle of politics and public hysteria. The film blends animation and live action in a visually arresting and aesthetically bold format. ‘Crocodile in the Yangtze’ screens at 1:45 pm. The movie follows China’s first Internet entrepreneur and former English teacher, Jack Ma, over 15 years as he battles government bureaucrats, global media and US Internet giant eBay to build China’s first global e-commerce company. Director Porter Erisman will be in attendance. Festival attendees will have an opportunity to view a variety of short films from 4:00 pm to 5:45 pm starting with Green Plastic Sandals, a short film in the tradition of Japanese horror like The Ring and Grudge. The values, conscience and inner conflict of a young Chinese American bride turns what is supposed to be her perfect day into something entirely different. The short narrative Bleached follows Lenny Blanco, a Filipino-American teenager who just wants to be left alone but unfortunately her overbearing and image-obsessed mother has other plans, forcing Lenny to model for a skin lightening cream to increase her cosmetic sales. Beauty, race, and American identity clash in this ‘dark’ comedy as Lenny struggles to reclaim herself. Lead Actress Henrietta Gard will be in attendance. The short documentary, Untitled: The State of Hip Hop in Shanghai, gives viewers a glimpse into the lives of four artists; B-Boy Danny Wang, MC Tim Wu Baby, Producer/MC Daddy Chang, and DJ Cavia; we’re introduced to the emerging Hip Hop scene in Shanghai, how it came about, and where it’s headed. Assumed Identity: The Art of Susan Sponsler, is a short documentary of the internationally recognized artist whose work challenges our perceptions of women and women-of-color. Here is a brief glimpse of the unheralded work of Asian American artist Susan Sponsler, a Korean adoptee living and working in Texas. Dol (First Birthday) a short narrative of a gay Korean-American man living in Koreatown, Los Angeles with his partner Brian and their dog Chloe. When Nick attends his baby nephew’s ‘Dol,’ a traditional Korean first birthday party, he finds himself yearning for a life just out of reach. Basic Rights Oregon’s short documentary, Our Families: LGBT Asian and Pacific Islander Stories features a community education campaign that includes a series of short videos highlighting the trials of triumphs of lesbian, gay, bisexual, and transgender (LGBT) people of color. In this video Asian and Pacific Islander families in Oregon share with us their personal experiences. Interviewee John Joo and Remie Calalang will be in attendance as well as Jett Johnson from The Pride Foundation. Featured on Saturday evening, April 28 at 6:30 pm is the documentary Mr. Cao Goes to Washington, the story of New Orleans nine-term Congressman, William Jefferson, who lost his seat to an obscure Republican candidate named Anh “Joseph” Cao, the first Vietnamese American Congressman, grassroots activist and social progressive who advocated for immigrant rights, gay rights, and government services for the poor. S. Leo Chiang offers a portrait of a complex individual navigating the fascinating, high stakes world of electoral politics, New Orleans style. Saturday night closes with the feature documentary Enemy Alien with the captivating narrative of Konrad Aderer, a Japanese American whose family was interned during World War II. Audiences will learn of the life and legacy of Farouk Abdel-Muhti, a gentle and indomitable Palestinian-born human rights activist, arrested in a targeted sweep of Muslim immigrants. A comparative documentary, Enemy Alien, traverses the history of detention past and present while emphasizing the profound spirit of resiliency and dignity. Filmmaker Konrad Aderer will be in attendance. Sunday, April 29, starts off with feature documentary Toward Living Pono, an intimate portrait of Hawaiʻi’s beloved actor Jason Scott Lee as he lives sustainably on his off-the-grid taro farm, 4,000 feet up the slopes of Mauna Loa, and works to spread the word about ‘mālama ʻāina’–caring for the land–to local youth. This feature encompasses the broad issues of materialism and alienation in western society, environmental stewardship, preservation of indigenous culture, youth advocacy, and living pono–with the traditional Hawaiian values of righteousness and respect for ancestors, neighbours, and the sacred land. The characters provide a timely and universally relevant example of how to live more sustainably and responsibly on Earth. Closing night movie features WEST IS WEST by Andy De Emmony of United Kingdom. A sequel to the internationally acclaimed film East is East—this is a universal story of diaspora, identity formation and negotiating the past and the present, West is West captures the trials and tribulations of Sajid, a 15 year-old British Pakistani as he resists the weight of his father’s tradition. In a clash of sensibilities and cultures, the father and son challenge one another to experience the world in new ways. Along this journey, the two embark on a trip to Pakistan’s Punjab that is heartfelt and hilarious. Through the eyes of Mr. Khan and Sajid we are offered two interpretations of Punjab: the romantic and repulsive. Their alternate perceptions chart each on a different path as they uncover what lies beneath of surface. Visually stunning and masterfully directed, West is West captures the complexity of colonialism, immigration, and identity from one generation to the next through, irony, tension, and humour. The DisOrient filmfest afterparty will be at Sabai Café and Bar. Many of the filmmakers will be in attendance to discuss their films after they are screened. Expand your horizons! Support your community. Join us and meet directors, actors, filmmakers, the staff and volunteers and avid film fans. A VIP ticket for $50 on-line/$60 at the door will entitle you to all 3 days’ screenings, meeting the filmmakers, food to snack on, and an invitation to attend opening and closing night receptions. Individual tickets are also available online. 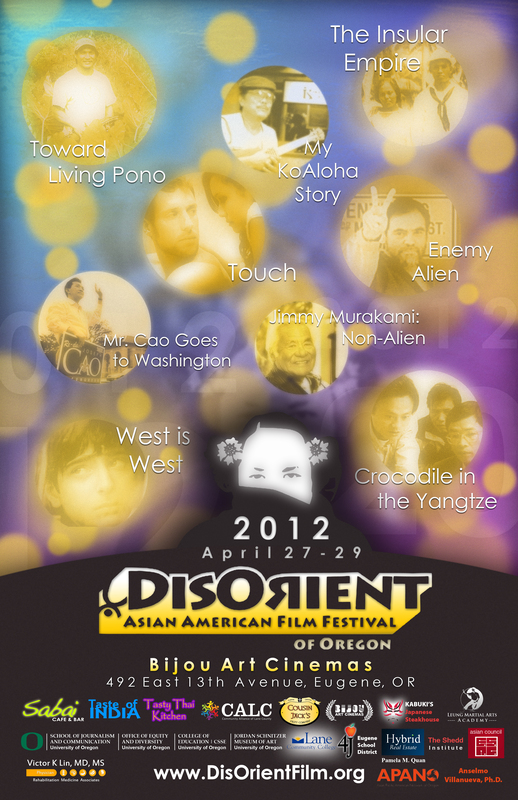 For schedule and information, check out http://www.disorientfilm.org.